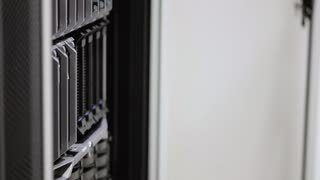 Search Results for "server blade"
Minsk, Belarus - May 17, 2018 (Ungraded): Server rack with Edge-Core fast ethernet switches and many 100 megabit cables blinking diodes. 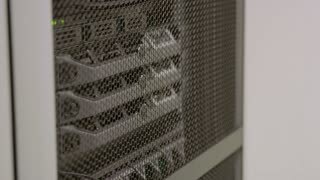 Ungraded: SAS storage unit in a dusty server rack blinking diodes. Original method of calculation in the restaurant. Check for lunch is nailed to the stump with ax. 1970s: People working: chef, cooks, waiter, bartender, busboy, stationary engineer, carpenter, electrician, plumber, painter, gardener. 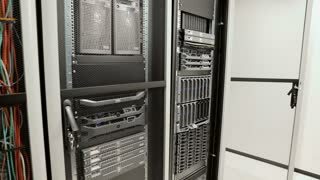 Camera Walkthrough Shot of a Working Data Center With Rows of Rack Servers. Shot on RED EPIC-W 8K Helium Cinema Camera. 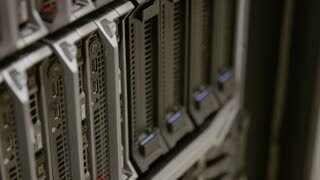 Camera slide near datacenter server racks. 4K 60 fps loopable animation. 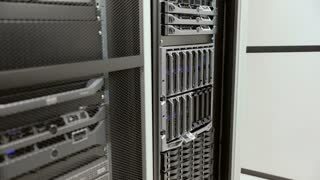 Camera fly around server room in data center. 60 fps loopable animation. 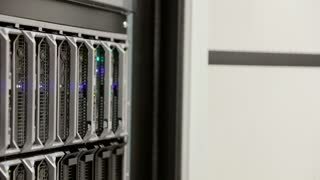 IT Engineer in Data Center Stands Before Server Rack Cabinet Working on His Laptop. Runs Diagnostics or Maintenance Job. Shot on RED EPIC-W 8K Helium Cinema Camera.